The 10th annual MUSINK, presented by Travis Barker, is set for March 17, 18, and 19, 2017 at the OC Fair & Events Center in Costa Mesa, CA. The three-day tattoo convention, car show and concert is America's largest tattoo and music festival, featuring hundreds of world-renowned tattoo artists, Famous Stars and Straps presents the Low and Slow Car Show, a vendor village and music from headliners NOFX, The Used, Bad Religion, Pennywise, and more. A limited number of discounted early bird tickets for MUSINK will be on sale this Wednesday, December 7 at 10:00 AM PT, while supplies last. Single-day, full weekend 3-day passes, and a selection of VIP ticketing options will also be available for purchase. Tickets can be purchased and additional ticketing information can be found at http://www.MusinkFest.com. 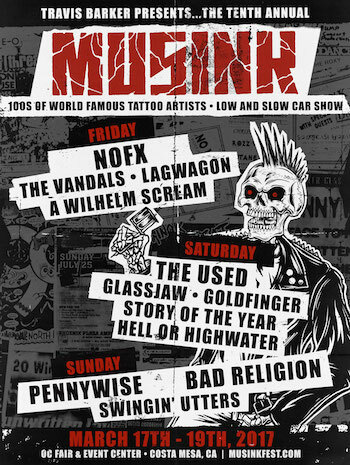 MUSINK producer Travis Barker says, "Stoked to be bringing in the 10th year of music, tattoos and cars with such legendary bands as NOFX, Pennywise, Bad Religion and The Vandals." NOFX's Fat Mike explains, "When I have a cold I like to listen to Muse and take lots of Zinc. So when I heard of the MUSINK festival I got stoked! 'We gotta play it!' Unless of course, I get sick." Fletcher Dragge of Pennywise says, "Couldn't be more stoked to be back playing MUSINK, one of the best festivals in Southern California, if not the best! Tattoos, music, cars, bikes, and never ending booze? How can it get any better? Always an insanely great party with good friends, awesome tattoo artists, and some of the best bands on the planet. It's a no brainer! See you in the pit, fools!" Dan Whitesides of The Used comments, "Hey everyone! We're so excited to be playing MUSINK in 2017! Travis Barker and company have been so kind as to ask us to play and we couldn't be more pumped! MUSINK is our first show back from being in the studio where we will be recording our new album. We love Orange County, LA and the surrounding areas so much, so please join us and get yourself a USED tattoo on your forehead while you're at it. See you soon! Love, Dan"
The MUSINK tattoo convention will feature hundreds of world-renowned tattoo artists. Specific tattoo artists that will be inking are viewable at http://www.MusinkFest.com. In addition, the MUSINK vendor midway will include dozens of vendors. MUSINK attendees are invited to check out Famous Stars and Straps presents the Low and Slow Car Show, which will display some of the best American classics and lowriders in Southern California, including some from Travis Barker's own collection. Daily tattoo contests will take place during the car show as well. All ages are welcome, and kids 7 years old and under get in free. MUSINK hours are 3:00 PM-10:00 PM on Friday, March 17, 12:00 PM-10:00 PM on Saturday, March 18, and 12:00 PM-9:00 PM on Sunday, March 19. MUSINK 2017 is produced by Bill Hardie, Travis Barker, John Reese of Synergy Global Entertainment (SGE), and Sean Akhavan. Synergy Global Entertainment, Inc. (SGE) is one of the world's premier music festival and integrated entertainment production companies. With hundreds of live events worldwide each year, SGE works with agencies, brands and musical talent to develop and produce or co-produce multiple entertainment properties across various genres and interests. SGE produces ODDBALL Comedy And Curiosity Festival. In addition, SGE co-produces the Rockstar Energy Drink Mayhem Festival and the worldwide Taste of Chaos Festival, the Ohana Music Festival, and conceived and developed KNOTFEST with Slipknot and 5B Artist Management. SGE has also produced many other national and regional festivals and tours. SGE senior staff have a combined 60 years of experience in artist management, large scale festival production and brand integration. SGE excels at integrating brands' needs with large scale musical entertainment.